Once famous for its bustling nightlife and the crowds of young people flocking the island every year to party till they drop, Ios has managed to broaden its possibilities, and today smoothly blends joyful days on the beach and lively night entertainment with more chill-out options for those who seek a relaxing holiday in the cosmopolitan ambiance of a whitewashed retreat, like Ios. In the main town, Chora, you will find buildings of typical Cycladic architecture, winding alleys lined with bars, cafes and tavernas serving Greek and international cuisine, as well. What’s more the town also boasts a plethora of souvenir and jewelry outlets for some shopping. Another highlight of Ios are the clean and superb beaches. From top-notch Mylopotas beach featuring the majority of luxury hotels, the infamous Ios campground and wild happenings to the exotic Maganari and long stretched Ayia Theodhoti, Ios has it all. Thanks to its rich seabed, Ios is extremely popular to snorkelers; and its diverse landscape, makes the island ideal for hiking though trails nestled in dramatic surroundings. This Byzantine castle used to be an observation point for the locals to watch over the seaway from Istanbul to Crete. Today the visitor can admire the castle’s walls, as well as a historical church dedicated to Virgin Mary. The view from its hilltop location is magnificent as you can even see the neighbouring islands. The traditional windmills adorn the north western part of Chora. Some of them have been restored and are available to visit. The museum displays archaeological exhibits from prehistoric Skarkos settlement, most of which are in excellent condition, as well as more items from prehistoric and roman times. The island boasts more than 30 beaches, from organized to secluded ones and from sandy stretches to pebbled coves. However, the water is always crystal clear. The most famous of all is Mylopotas, a wide stretch of sand about 2km long offering sun beds and parasols for rental. Beach bars and water sports are also available for some extra fun. 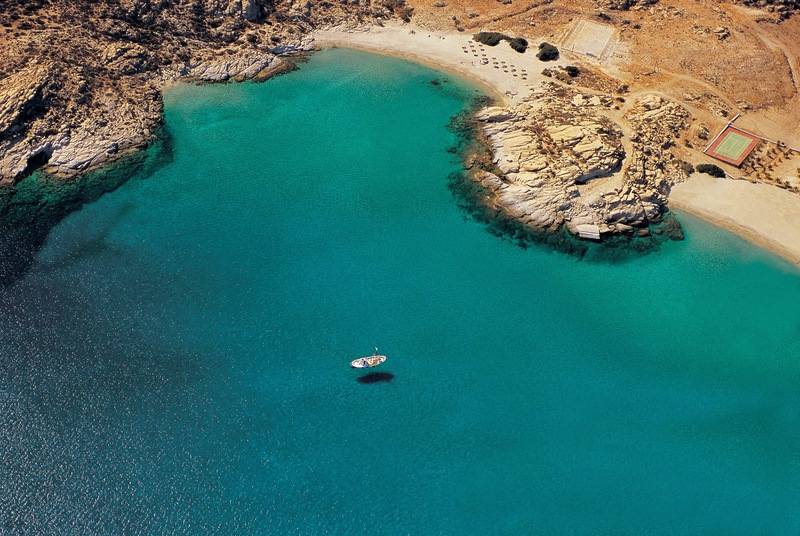 For more soft sand seashores you can visit Koumpara, Gialos and Ayia Theodoti beaches. Nudists can swim at Kolitsani beach and those of you looking for convenient amenities should try Maganari. Other beaches, such as Klima and Pikri Nero are only accessible by sea. When it comes to food, Ios is mainly famous for its cheese, which is traditionally produced in the local dairy premises. In Ios, visitors will find a selection of cheese types, such as skotyri (spicy aromatic cheese) and xino (white cream cheese), as well as the more common types of yellow hard cheese-kefalotyri and graviera. Exceptional fava, oregon and caper are also typical products of Ios. Dining wise, you shouldn’t leave the island without tasting tsimetia (courgette flowers filled with rice), local meat paired with homemade pasta, and mermitzeli (a type of homemade Greek pasta).